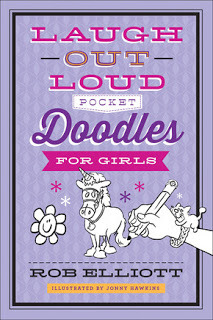 Are you looking for a way to encourage your daughter’s creative juices? Would you rather she kills time in a book rather than on an electronic device? Then this book is for her! The pages of this book include half-drawn illustrations that your child needs to finish based on the joke or riddle on the page. These are my daughter’s illustrations. 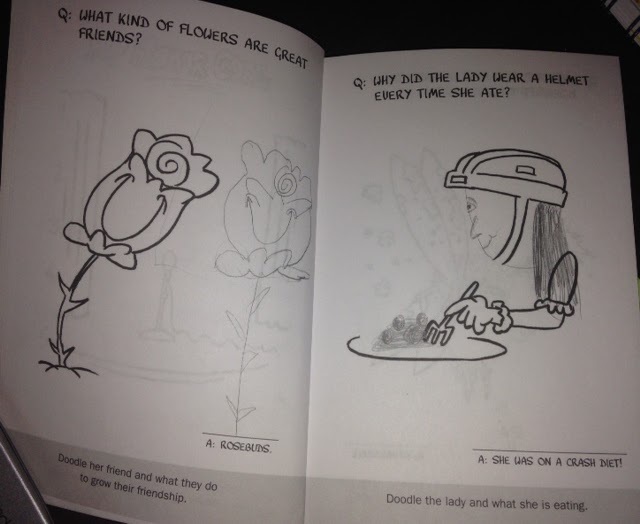 The left side states, “What kind of flowers are great friends? Rosebuds”. My daughter drew another rosebud. On the right side, it states, “Why did the lady wear a helmet every time she ate? She was on a crash diet.” So my daughter finished drawing the lady and then added some spaghetti and meatballs to her plate. Now if she was following the joke, she could have drawn two cars crashing on the plate, but it doesn’t matter. That is the joy of this book, the kids can create whatever they want on the pages. The pages in this book can fill up a few minutes or hours of time, depending on your needs. Once your child has completed a few drawings, be sure to encourage her to share her creations with grandparents, siblings, and friends and she can revel in the telling of the jokes as well. 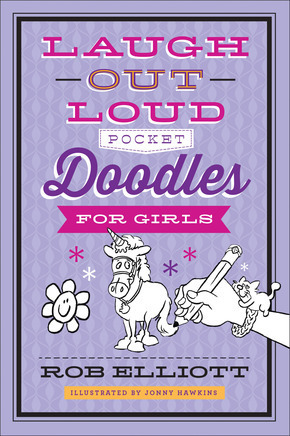 Even though this book states it’s for girls on the cover, many of the pages aren’t just for girls. The pages are full of animals, people, and food, not princesses and dolls. This book is small in size and fits in my hand which makes it easy to tuck into your purse with a pencil and pull it out whenever you have time to fill: on a car ride, in a waiting room, while waiting for the bus, or at a restaurant. The illustrations are easy for kids to either finish or add their own next to. They aren’t overly detailed but enough that you can see the personality of the animal or person in Hawkin’s original drawing. These are the kind of books that I love to give as gifts because they are unique and help parents fill time and encourage imagination. There is a similar book for boys as well. These books would even fit in their Christmas stockings, so by ordering now, you could have your shopping done for all your grandkids, nieces, nephews, and your own children! Rob Elliott has been a publishing professional for more than 15 years. He lives in West Michigan, where in his spare time he enjoys laughing out loud with his wife and four children. 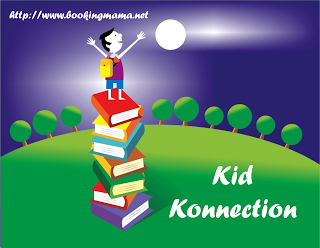 I will be linking up with Booking Mama’s Kid Konnection on Saturday. Click HERE to see other bloggers share reviews and spotlights of other children’s and YA books. Thanks to the publisher for sending a copy of this book for the purpose of this review. This review is my honest opinion. I was not compensated in anyway for this review. If you choose to purchase the book through the above link, I may receive a small commission without you having to pay a cent more for your purchase. Thanks for supporting SincerelyStacie.com reviews. So fun! I'm going to add these to my Christmas list for my son and his cousins. As I was reading your review I was wondering if there was a version for boys and was happy to discover you had the book cover of that version at the bottom of your review. My son loves to draw and this nifty book would be great to bring on vacation with us. Thanks for spotlighting it!